I went online to find Arthur a girlfriend. 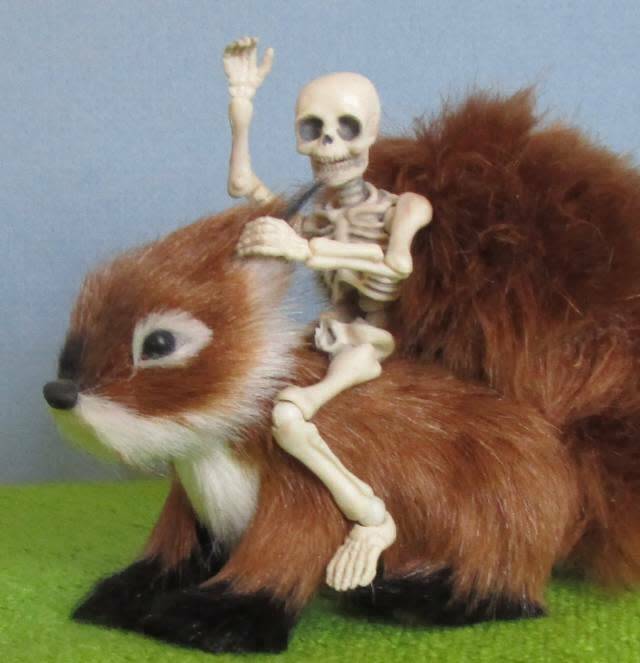 At first, the best I could find was Re-Ment posable skeletons. They are numbered so you can tell which one you’re getting – #1 man I believe is the smallest at 3 1/4" tall, #2 is supposed to be a child, #3 is a man at 3 3/4", and #4 is a woman. 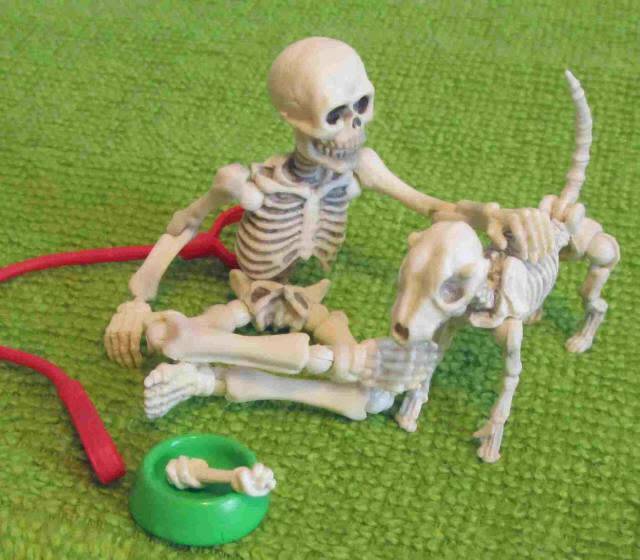 A dog (1 1/2" tall & 2 1/4" long including tail) and a cat are also available. (Note: the sizes listed on Amazon are wrong.) 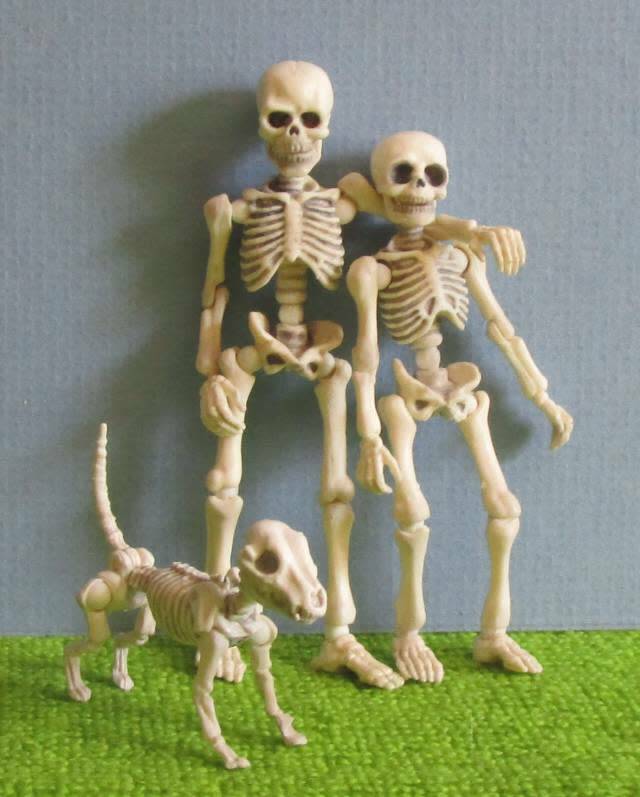 The thing that is so cool about them is that they are posable! Their jaws work too, and the humans come with an extra set of gripping hands. They said the #1 man can grip Lego swords, etc., but I haven’t tried that out yet. 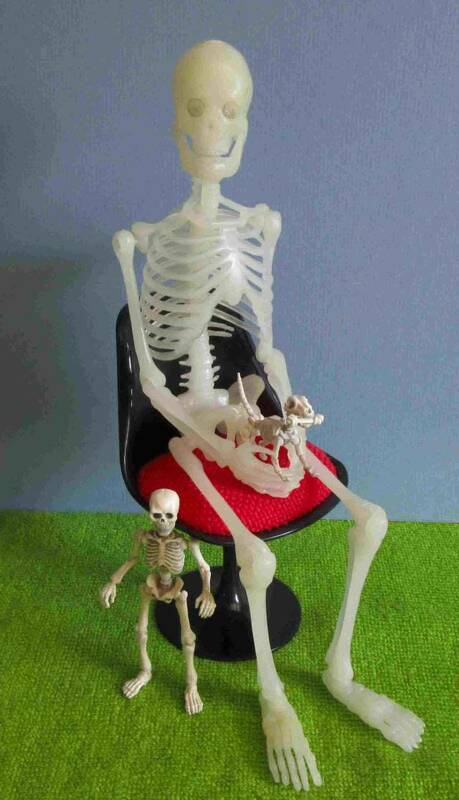 The company has even made playsets for these skeletons! I did buy the #1, #3, a dog, and a Lego dragon sword. As long as the sword works out, my oldest is going to get the #1 man and a sword. The problem is that the humans are way too small for Arthur (he’s about 12 inches). But – wait for it – this is the exciting news! When I went back online, I actually found the same skeleton as Arthur! I can’t believe that after 20 years that he’s still in production. My oldest accused me of being deceptive – he claims that I gave him Arthur a long time ago; I say I didn’t. Now I can give him his own glow-in-the-dark friend! And what’s really funny is after all this time the reviewers’ complaint is the same I had – he falls apart too easily. Still haven’t figured out how to fix that yet. Arthur is so happy. I gave him a red cushioned chair to sit on, which is much better than the cardboard box. He loves his new puppy and is accepting name suggestions. He is really enjoying his two new friends, even if they’re quite a bit shorter than he is. I haven’t told him about his new girlfriend yet, because I want that to be a surprise. The only thing left is to make an “upholstered” chair, or maybe loveseat, for the new couple. Clothes, too. Must get busy on that, pronto!